Lenovo's staggeringly powerful and well-equipped B570 easily asserts itself as one of the best laptops around for this kind of money. The plain black chassis design puts function firmly before form. The tough, ridged plastics easily withstand scuffs and scratches and the firm lid capably protects the screen from damage. Although this is not the heaviest laptop we've seen, at 2.4kg it's also not ideal for regularly working on the move. The 157-minute battery life is average and can keep you working on short journeys, but falls far short of the four-hour mobility of the compact Alienware M11x. Lenovo's ThinkPad laptops are known for their fantastic keyboards and some of this quality has trickled down to its budget range. The B570's excellent, isolated-style keyboard's well-spaced buttons move smoothly, quietly and accurately at all times. Even speed typing is a pleasure. The huge touchpad and mouse buttons are just as pleasing to use and the pad's textured finish makes it easy to find when typing. The wide design perfectly suits the screen's dimensions and enables you to scroll from one side of the screen to the other without removing your finger from the touchpad. The screen is gorgeous and renders photos and videos beautifully. While the glossy Super-TFT coating is very reflective and not suitable for outdoor use, it delivers strong colour reproduction, sharp contrast and strikingly detailed images. Despite using a technically less-capable processor than the Alienware, the Lenovo vastly outperformed its rival. The second-generation Intel Core i5 processor flew through our benchmark tests and runs incredibly quickly for such an affordable laptop. Backed by 8GB of memory, you can also comfortably multitask with no slowdown. Graphics are less powerful, but still more than capable for most needs. The entry-level Nvidia GT 410M graphics can't compete with the Acer Aspire 5943G and Alienware's high-powered chips, but there is plenty of power for basic photo and video editing. Regular gaming will be out of reach, however. The Lenovo's real strength is its vast storage. The 750GB hard drive is outstanding at this price and provides far more space than most other laptops. Even if you plan to store thousands of songs, videos and photos on your laptop, you'll be unlikely to fill this drive, even over many years of use. Several useful security features also let you keep your files safe and secure. For example, a fingerprint scanner on the palm rest offers biometric protection against unauthorised access, while proprietary Lenovo software enables you to encrypt sections of the hard drive to keep private files hidden. Lastly, you also get a comprehensive selection of Lenovo software for managing power consumption and data recovery, among others; high-speed fixed and wireless network connectivity via built-in Gigabit Ethernet and 802.11n Wi-Fi modules and Bluetooth connectivity for wirelessly sharing files with external devices. Although the B570 is bettered by the Acer's high-def multimedia features and the Alienware's mobility, it is still a fantastic laptop. 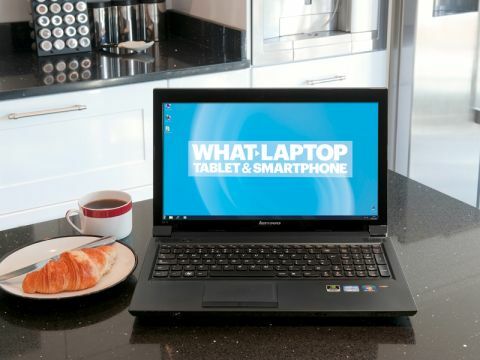 Its resilient build, strong performance, great user interface and capacious storage pack all you could need from an entry-level laptop and this is a machine we can heartily recommend.